Fly fishing flies are one of the most important parts of your fly fishing gear. The Fly is what the fish ultimately sees, and determines whether the fish bites or not. If you’ve visited your local fly fishing store or browsed around online, you’ll quickly learn that there more flies than you can count! literally thousands of different designs. With that being said, as you begin learning how to fly fish, how do you know which fly to use? To be honest, the answer is a bit subjective, and different fly anglers will all have their own opinions, and probably a few stories to go along with them! The type of fly you’ll want to use is also driven by the type of fish you’re after. For example, fly fishing for trout will require certain types of flies, where fly fishing for Steelhead will require other types. There are three basic types of fly fishing flies. Each has it’s own set of advantages and disadvantages, depending on the type of fishing you are doing, and the location you are fishing. To help you answer the question of “How do you know which fly to use”, let’s take a look at the main types of fly fishing flies available and discuss the pros and cons of each. The Dry Fly is the most common and famous of the types of fly fishing flies. It’s the one that comes to mind when most people think of fly fishing. The Dry Fly is designed to float on top of the water, and simulate an insect landing on the water or floating on top of the water. The fish, swimming below the water will spot the dry fly as it hits the surface of the water. If it finds the fly appealing, will zip quickly up to the surface, and grab the fly it it’s mouth. This whole process makes for a beautiful display as the fish hits the fly, and launches itself into the air a bit. This is the moment most fly fishers fish for. It also has the benefit of very visibly letting you know the fish has taken your fly and is ready to reel in. Most are designed to visibly resemble insects that hatch in or near the water, and then become flying insects that live around the water. This whole process is commonly called “Matching the Hatch” by fly fishers. Many fly fishing flies resemble mayflies, caddisflies, stoneflies, midges, mosquitos, and many more. An excellent book and reference on identifying insects (or hatches) is: Hatches II: A Complete Guide to the Hatches of North American Trout Streams. Less common are dry flies that match terrestrial types of bugs, such as grasshoppers, crickets, ants, etc. These types of bugs often float on or across the water. Terrrestrial flies are usually larger in size and made out of foam materials to help them float. Terrestrial flies are gaining in popularity as designs are becoming more and more realistic to fish. Traditionally it was thought that most fish don’t bite terrestrial insects. This is proving to be not true as fly quality has improved over the years. In fact, many fly fishers are having great success using terrestrial bait, even on trout which are typically fished using standard dry flies. Finally, the third type of is an attractor fly. Attractor flies are not intended to look like an insect or even resemble one. These flies are designed to attract fish using bright colors, shiny materials, and often long pieces of rubber or material that move in the water. With these flies you are trying to get the fishes attention quickly so that it strikes or bites before paying any attention to whether the fly looks like food or not. Dry fly fishing is the most exciting and popular type of fly fishing, but unfortunately doesn’t always lead to a great deal of success. It really depends on water conditions, the area you are fishing, water temperatures, time of day, and many other factors. Also, the type of fish you are after can influence success as well. For example, generally fish only hit on above the water food 20% of the time. 80% of the time they feed below water. But don’t let this frustrate you – We always use different types of flies while out fishing. Using a variety and trying different flies to see what works is always the best combination. While not as exciting as the dry fly, the nymph fly fishing fly is seen as the most successful fly for fly fishing in most scenarios. Many fish, including trout feed mostly under the water, not on top of it. The nymph’s whole purpose is to work just below the water’s surface, to on top. A Nymph fly simulates an insects nymph lifecycle stage, where the insect spends the majority of it’s time underwater. These nymphs become a very plentiful food source for fish, and thus serve as an excellent bait. The trick with using a nymph fly is that special fishing techniques must be used. The biggest issue is that since the nymph is below the water, can can’t generally see the fish visibly strike bait. Most fly fishers solve this problem using a strike indicator. A strike indicator is a small float that attaches to your fly line or leader, and will move suddenly or drop below the surface briefly when a fish strikes. The lag time between when you realize the strike indicator is “indicating” and when you recognize it. The strike indicator floats on the top of the water and is brightly colored, which could scare the fish. If you are fishing in closer quarters where you can see below the water (often the case when fly fishing in a mountain stream), a strike indicator isn’t required as you can see the nymph fly and the fish. Finally we have the streamer fly. Streamer fly fishing flies are intended to mimic larger water animals such as: minnows, leaches and other larger waterline. Fly fishing is done a little differently when using a Streamer. Instead of floating the fly above (dry fly) or below (nymph) the water an waiting for the fish to strike, with a Streamer fly, you float it, but the move it by pulling on the line. The intent is to move the fly in a bursts, either long or short. 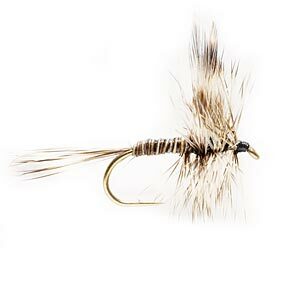 This bursting movement, combined with the unique design of the streamer fly mimics a live creature. Fish are naturally drawn to this sort of motion, especially on a large size fly like this. Fish strikes on streamer flies tend to be fast and hard. The fish is trying to keep to bait from getting away. When using a steamer fly, you’ll want to use a heavier leader and tippet. Now you know have a basic understanding of the various types of fly fishing flies. Just know, that even within each type, there are thousands of various designs, colors, hook sizes and hook types. We recommend talking to some local fly fish in anglers and see what they’ve had the best success with in your area. If you don’t know anyone, just head over to your local fly shop, they’ll know. Pick up a few packs of the three different types, and bring them along with you. 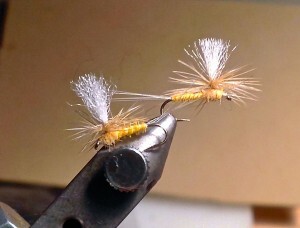 Start with one and if doesn’t work try other fly deigns and types.